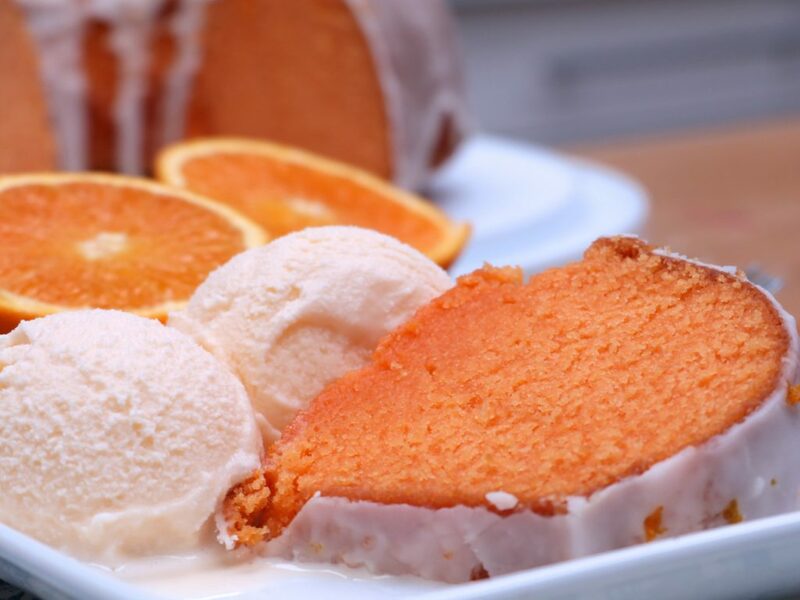 Watch me make this glazed orange dream pound cake from start to finish! If you haven’t figured it out by now I have pound cake recipes for DAYZZZZZ!!!! I swear there will never be a shortage of them on Divas Can Cook thanks to my obsession with them! Gosh they make me so happy! My husband’s grandmother has an entire file cabinet row FULL of nothing but hand-written pound cake recipes that dates as far back as the 1800’s. I could seriously spend all day browsing through her expansive recipe collection. 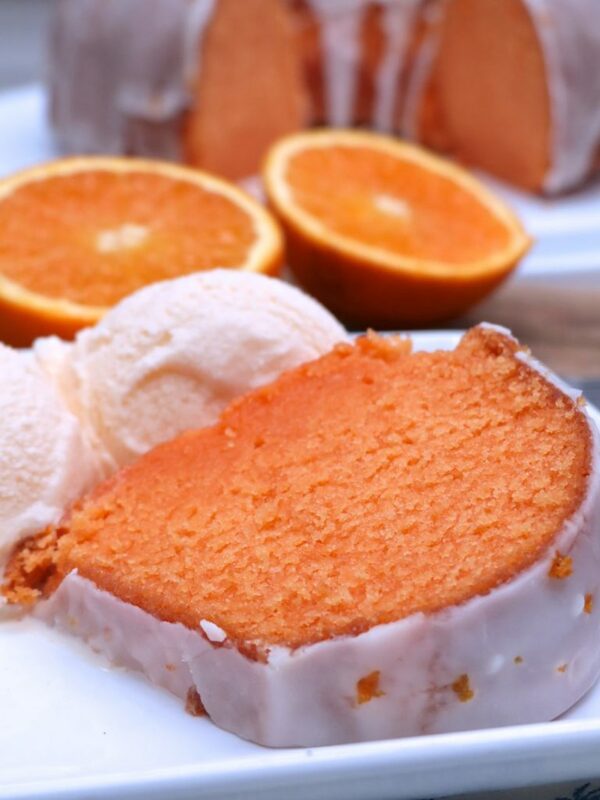 When I saw this recipe for a glazed orange dream pound cake I had to give it a try. The first time I made it I wasn’t too thrilled with the texture so I adjusted the fats to get that moist, velvety texture that I love! It was an easy adaptation. I also replaced the orange juice with orange soda and a bit more orange and vanilla extract. Even though I’m not a huge fan of putting certain artificial ingredient like soda and coloring in my cakes, sometimes you just gotta DO IT to achieve a deeper flavor and color once it’s baked. And yep orange soda with some orange extract and orange zest was the ticket! It allowed the cake to have a perfectly light orange- vanilla flavor without one totally overpowering the other. And the texture, Lord have mercy! Just look at that velvety soft, tight crumb texture!! It’s freakin perfect! I tried a new organic, non-hydrongenated shortening (Spectrum) and it worked really good. I’m not 100% sold on it because I haven’t baked with it enough but if it continues to work out with my recipes, you’ll be seeing it more often on my channel. And they have butter-flavored as well! I’m always on the lookout to “clean up” some of my favorite ingredients! 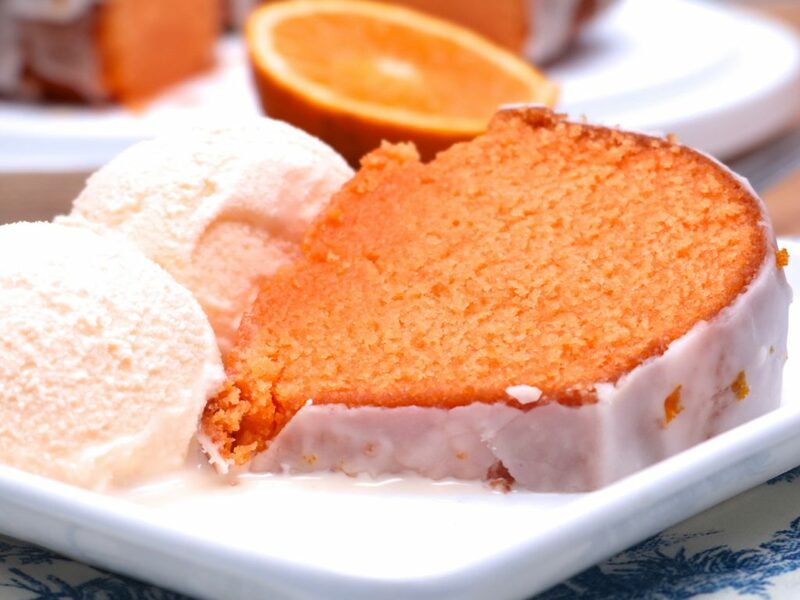 For this orange dream pound cake I used a simple vanilla- orange glaze. I think a vanilla-orange cream cheese glaze would also taste amazing on this cake! Grease and lightly flour a bundt pan. Set aside. Combine dry ingredients into wet ingredients, mixing gently, alternating with the orange soda. Stir in red and yellow food coloring to create a deeper orange color, if desired. Remove from oven and leave in pan until pan is warm to the touch. Remove cake from pan and place on a cooling rack until completely cooled. Mix glaze ingredients and pour over cooled cake. Sprinkle with orange zest and let glaze harden. I was wondering how much food coloring you out in the cake because when I made it, it didn’t come out the same color and I wanted a bright color. What size bundt pan do you use or do you use different sizes and how do you know which size to use with which recipe? I’ve gotten into making them and I love it they are easy for me to make than other cakes. Thank you for replying. What is zest of orange please? Good morning: I would like to make the cake, but I don’t have a Burnt pan, can I make on a pan of 9×13???? ?